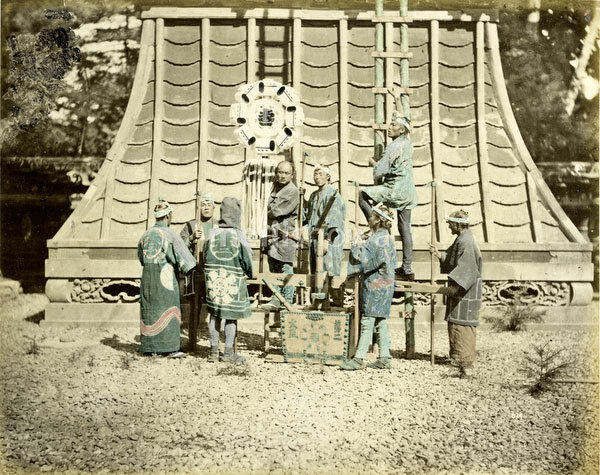 Hikeshigumi (火消組, firefighter brigade) with their Matoi (纏, fire standard). In 1720, the Hikeshigumi of Edo (pre-1868 Tokyo) were organized into 48 units, each with their own unique Matoi. The firefighters in this image are holding Tobiguchi (鳶口), special firefighting pikes. Instead of extinguishing fires, Hikeshigumi tore down neighboring buildings to prevent the fire from spreading. Fires were a great problem in Japanese cities. Edo alone counted over five hundred major fires between 1851 and 1867.